The "Upload Debugging Information" item in JMRI Help menus lets you store debugging information where the JMRI developers can easily find it. The information contains all of the specific details of your JMRI installation, including the log from the most recent running of the program, but doesn't contain any of your private information. You can see previous problem reports on the jmri-reports mailing list. To make the information most useful, you should do the upload as soon as possible after encountering the problem, so that any useful information hasn't been overwritten. 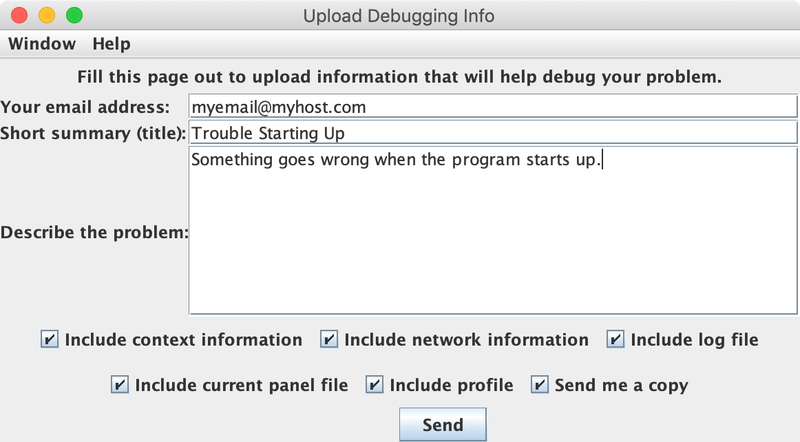 The "Upload Debugging Information" help item will open a new window with three fields and six checkboxes. Enter your email address in the top line. It won't be made visible to the public, but we do require a valid email address to cut down on spam. In the next field, enter a one-line summary of the problem that will appear as the subject of the upload. Finally, type a few lines describing want went wrong, how to recreate it, etc. Normally, you leave the checkboxes marked so that the report will contain the context information (JMRI version, Java version, hardware types, etc) and the most recent log files. If you don't want to include those for some reason, just uncheck them. Finally, push send. If everything goes OK, the window will close itself in a couple of seconds after the information has been sent. Note: Uploading this information will not necessarily result in somebody leaping up to fix your problem. This is not a support request, it's just a convenient way to get your program information where people can see it. If you want quick help with a problem, you should talk with some JMRI users in your area (it's always good to talk to friends), or ask on the JMRI users group.